Move over Pokemon masters, the DigiDestined are back! When I heard that there would be another Digimon adaptation based on the original Digimon Adventure, I was jumping up and down with excitement. Growing up as a kid we had: Sailor Moon, Digimon, Pokemon, Beyblade, Yu-Gi-Oh and a slew of other great shows that were part of my morning television watches before heading to school. So hearing that the original Digimon was getting another adaptation, I was more than psyched to see it. Keep in mind that this is only a review for the first movie and there will be a total of six of them throughout a specific timeline. Since the first movie was divided into four episodes, it's a bit uncertain where the direction the story is going to go because there are five movies that are yet to come. From the looks of it, it seems like something is driving certain digimon to go back in action terrorizing the people of Japan and the DigiDestined are reunited with their digimon to combat whatever's terrorizing Japan. There are also these men in black who appear and seem to assist the DigiDestind throughout the first four episodes, what their role during the remainder of the anime is also up in the air. Needless to say that there is a lot of ambiguity within the first movie, which I assume will be cleared up in the coming movies. Before I get into what I liked about these four episodes, I'll discuss what I disliked. One thing I hated was the introduction to these men in black but we don't get a backstory on what their deal is. The other aspect I disliked was when they introduced a new DigiDestined at the end of the last episode. Like really... how are you going to make me wait a few more months to see what this trick has up her sleeve? Which also brings up the fact that why does Toei Animation have to spread these movies over a few months? I'm not getting any younger! And the other thing I disliked was during the last episode when everyone was fighting Alphamon, for some reason the animation for the ultimate levels were skipped... WHY?! Gah, but other than that I loved everything else. If anything this first movie was an entree to a nostalgia rollercoaster. When I heard the OP and ED, I swear to you I was so damn giddy and it just brought back old memories of watching this stuff when I was a kid. The hairs on the back of my neck stood up when I saw Agumon digivolving to Greymon and Brave Heart was playing in the background. When everyone reunited at Haneda airport with their digimon and the rookie digimon digivolved into their champion forms, I was smiling ear to ear and filled with happiness. I was just gleaming with joy watching these four episodes, Digimon is one of my all time favourites so watching Saikai really was a treat. The first thing that sort of obvious is the visuals are slightly different from the original. To be honest I wasn't that big of the fan of the character designs at first, I would have liked to see a modernized or brushed up version of the original character designs. The digimon looked fine, but I have no clue why the animators chose a different route with the character designs. Not that big of a deal for me, compared to others who disliked it, but I'm really liking the character designs as of now. The colouring is beautiful, which was an upgrade from the original Digimon Adventure. I'll briefly go over the main characters, not the digimon, and give my thoughts about everyone. Hikari and Takeru... are they together or no? I don't really have much to say about these two since they didn't leave much of an impression on me. These two were always modest/ down to earth in both Digimon Adventure and Digimon Adventure 02. I guess the same modesty is seen in these four episodes as well. I was also happy that Takeru's Digimon 02 digivice was used for Palmon's champion evolution to Angemon. Looking forward to what these two have to offer by the end of this saga. Speaking of Digimon 02, what happened to Iori, Daisuke, Ken and Miyoko? I hope they make some sort of appearance in Digimon Tri. And I hope we get to see Tailmon and Patamon's armour evolutions! Jou seems a bit disenfranchised by the whole "the digimon are coming back" notion. I felt like he wasn't that big of a fan entering the digital world the first time, and now that digimon are resurfacing, it seems like he's trying to distance himself from that and focus on school. I'm intrigued to see his role in the next movie. Izumi has always been the brainiac/ backbone of the entire group. Nothing has really changed with him, nor am I really excited to see what he has to offer in the next couple of episodes. If anything I'm more excited for Tentomon's mega evolution (if that does get animated). Yamato and Taichi never seem to see things eye to eye on certain subjects surrounding the digital world. It felt like old times seeing these two get heated over different points of views. I'm sure the fight they had in the first movie won't be the last one they have against one another. I loved Mimi and her endless array of hairstyles, she's the one that really brings life to this group most of the time with her bountiful personality. Sora on the other hand didn't leave much of an impression on me, she's more neutral like Takeru and Hikari. I was always fascinated by her relationship with her mother, though I know they're on good terms now. I'm also curious if they'll develop that Sora and Yamato relationship, it's pretty obvious that it's a one sided romance; they probably won't get into that relationship as much. As with Tentomon, I'm most excited to see Piyomon and Palmon's mega forms (if they actually bring that into the anime). Anyways, that's it for this review. I know this review longer than my usual reviews, but that's because I just absolutely love Digimon. The wait for the second movie is slowly killing me. For those who saw the promo photos for the second movie, you would have seen that Palmon and Gomamon's mega forms are on the cover! Besides Agumon, Gabumon, Patamon and Tailmon, I'm so stoked to see if we actually get to see the mega forms of Tentomon, Palmon, Gomamon and Piyomon actually being animated. For those of you who don't remember Tailmon and Palmon's mega forms were animated in the Digimon 02 movie. And yes I know this review is late, I'll try my best to write another review right after the second movie comes out! 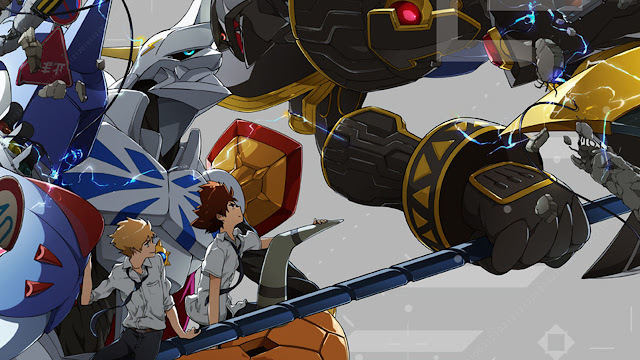 If you're a Digimon fan, please share your thoughts in the comments section of what you thought of the Digimon Adventure tri. Saikai movie. I'd love to hear what you think!